Hi, around three days ago I received a package of Revlon Photoready Collection from Revlon Indonesia. The package contained Revlon Photoready Color Correcting Primer, Revlon Photoready Airbrush Mousse Makeup in Medium Beige, and an information booklet about Photoready Collection. So, Revlon Photoready is a High Definition Makeup includes compact makeup, powder, concealer, makeup, and translucent finisher. For airbrushed appearance in any light. First, I appied Revlon Photoready Color Correcting Primer. It is lightweight primer which smoothes skin while evening out skin tone with color correcting pigments that neutralizes redness and uneven color. I like the texture, it's creamy and blends easily. Have to apply it with light strokes because if you rub it then there will be some residues. The primer has a very soft fragrance which I love too. The result is satisfying I think. It evened out my skin tone. 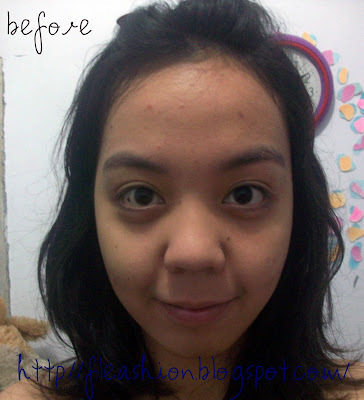 Then, I applied the Revlon Photoready Airbrush Mousse Makeup in Medium Beige. You can get airbrushed finish with this, it will be light-as-air mousse makeup. It also has photochromatic pigments which minimize the appearance of flaws for a smooth, poreless look. This was my first time applying mousse foundation. I guess I love this too. I just love how lightweight this makeup is. I tried using this mousse makeup both with foundation brush and finger, and I think it will be better to set this mousse makeup with brush as the Revlon's Makeup Artist said (I heard this from Revlon's past event at Gandaria City). So, here are my faces before and after using both of these products from Revlon Photoready Collection. Actually I'm targeting the Revlon Photoready Sculpting Blush Palette. Hihihi, hopefully I can buy that. ini juga pertama kalinya aku pake revlon buat complexion. hihihi..
wah...hasilnya jadi bagus gitu yah. coveragenya bagus. btw oil control nya gimana kl seharian pakai di luar ruangan? trus bikin jerawatan gak kalo seharian pakai? coverage-nya oke tuh kayaknua :D btw bisa dapet gitu gimana caranya yaah?? coverage oke bangetsss tapi yah begitulah, staying powernya rendah..